During this Paryushan, Jain Society of Pittsburgh (JSOP) had various religious activities. Every morning the temple held Samuh Navaang Puja and lectures by Arvindbhai Bhandari (from New Jersey) in the afternoon. Other topics for the week were Rahasya of Navaang Puja/ Aasthprakari Puja, Shatrunjay and Girnar tirth’s Mahtmya, Atma( know your own soul) and Kshamapna. 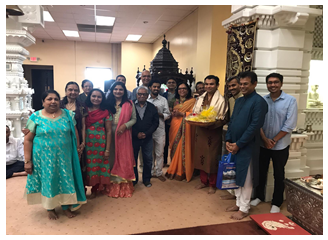 Along with the members of Jain society of Pittsburgh, students from local universities and Penn State also participated in this auspicious celebration. There were about 6 people who did aththam, one person had five upvas, and one had 45 ekasanas. Das Lakshan Parv was celebrated with same enthusiasm. They had Das Lakshan Puja at the beginning of the Parv and kshamavani puja was attended by approximately 80 people. Many of the members did tapsya during the ten days and observed one of the ten dharmas every day. On September 29, the Sangh from New York (JCA) visited JSOP Temple for Chaityaparipati. The members of Jain Society gave them a warm welcome. We had Sangh Puja, Samuh Chaitya- Vandan, Aarti and Mangal-Divo. The delicious lunch (Sadhrmik Vatsalya) was served at the community hall. 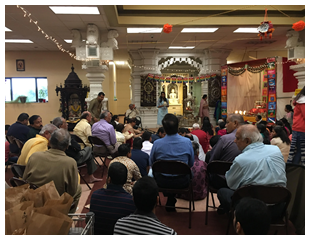 This year, Jain Society of Pittsburgh celebrated Mahavir Janma Kalyanak on April 1st. The Snatra puja was the main aspect of the program. The Puja was performed by Shri Dipen Shah, the priests of Hindu Jain Temple Shri Suresh Joshiji on Harmonium and Shri Jagdishji on Tabla. The Snatra puja was performed with melodious devotion which created a divine atmosphere. The Puja was followed by Sadhrmik Vatsalya. There were 150 people present for the program.